Elevated CO2 ring with 8 cassava cultivars from Africa. Cassava, a drought tolerant crop that forms large storage roots, is a very important staple crop in places where food insecurity is a reality. Because cassava is a critical food security crop it is very important to understand how it will respond to climate change and to identify cultivars that best adapted to portending climatic changes and can take maximum advantage of growth stimulation by increasing atmospheric [CO2]. I am currently the principal postdoc in the CassFACE experiment, which is designed to identify African cassava cultivars with a great yield potential under elevated [CO2] conditions. The final objective of the project is to use the selected cultivars for genetic improvement. 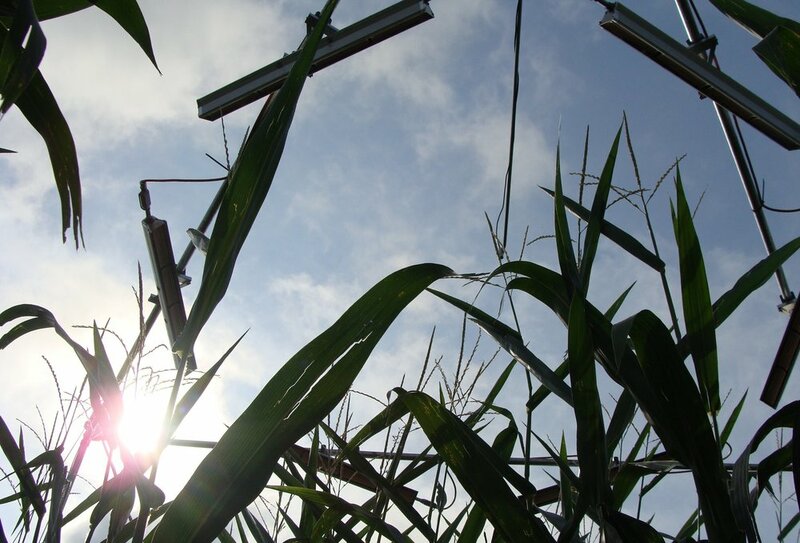 can changes in canopy architecture increase soybean light interception efficiency? Light energy is wasted at the top of the canopy because plants can not use all its energy whereas leaves deeper in canopy are light starved. Altering the architecture of the plants, for example by changing the size of petioles, has the potential to allow more light into the lower layers of the canopy increasing the overall canopy carbon gain, biomass and yield. I used near isogenic lines of soybeans with short and normal petiole size phenotype to evaluate the advantages of manipulating the petiole size in the overall light interception, utilization efficiency and yield potential of soybean. Tobacco cv. Mammoth and cv. Petit Havana growing in an elevated CO2 plot. how is the sink strength altered? C3 plants are able to produce more biomass with the increased [CO2], but this response can be limited by the size and strength of sink organs and/or by nutrient uptake. Using nitrogen supply to vary sink strength my experiment with tobacco showed the elimination of sink limitation when the sink increases due to the stimulation of growth and biomass at high [CO2] (Ruiz-Vera et al., 2017). This was an experiment developed as part of the Ripe project (http://ripe.illinois.edu/). I studied how the effects of elevated CO2 combined with increases in temperature affected photosynthesis, plant development and productivity of the principal crops in the Midwest, soybean and maize. My research revealed the negative impacts of global warming on photosynthesis and productivity in soybean and maize (Ruiz-Vera et al., 2013; Ruiz-Vera et al., 2015); impacts that had not been predicted from previous greenhouse and enclosure experiments. My research also exposed the inability of the widely-used growing-degree days model to predict plant development under warming conditions, because this model does not account for developmental acclimation to warmer temperatures (Ruiz-Vera et al., 2018). Additionally, these field studies also showed that the rate of dark respiration is highly dependent on the availability of resources for growth (Ruiz-Vera et al 2018) and thus will not necessarily increase with rising temperatures as predicted from other studies. A clear conclusion from my work is the critical need to improve the physiological tolerance of crops to warming conditions.